1. The govemment of Sudan (GOS) filed a complaint to HQ CFC accusing the SLA of a ceasefire violation in the general area of Dar Essalam and Wada. The GOS alleged that the attack on the civil population was carried out in the village which led to the death of 3 persons and 1 injured. 2. A team composed of 7 MILOBs was tasked to investigate the complain on 24 and 25 August 04 respectively. 3. The arming of people in Dar Essalam with weapons created the problem by attracting bandits to confiscate these weapons. Mohammed Janjaweed committed crimes against the civil population such as looting, arson, and murder. 4. Mohammed Janjaweed also assumed the authority of SLA and mislsed this authority by committing crimes. 5. 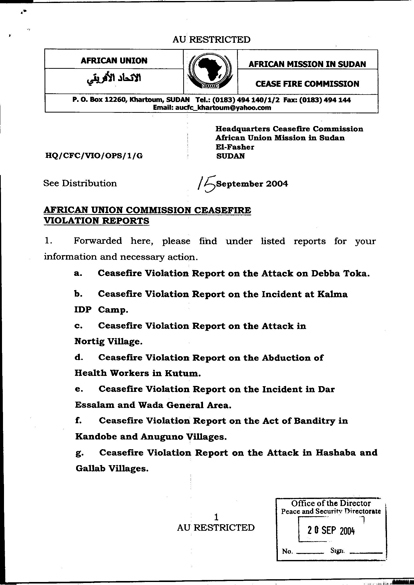 On 18 Aug 04, a complaint was filed to HQ CFC accusing SLA of committing acts of atrocities in the village of Dar Essalam and it environs. Upon investigation, it was discovered that Mohammed Janjaweed while claiming to be an SLA member, committed acts of abduction, assaults, killing and unlawful collection of taxes between 13 and 16 Aug 04.
a. The SLA must enforce control over its troops. The SLA must neutralize groups harassing the local population and provide security. b. Mohammed Janjaweed must face legal action for his crimes. c. The CFC must be informed by SLA of the actions take against Mohammed Janjaweed. d. The SLA, JEM and GOS must enforce a weapon control process. Weapons have to be certified and registered in their controlled areas. This will be the first step of a future disarmament process. 6. Patrols carried out within a radius of 131kms South East of AI-Fashir revealed that there is an on going arms race within the general area. A good number of people king security had acquired arms and some persons had given out the identity f people in possession of arms to a group claiming to be SLA. Apparently, this group is undertaking a disarmament business in the general area of Dar Essalam and Wada. Additionally I they have taken revenue generated from water and animal taxes unlawfully and further dispossessed people of their vehicles and properties claiming to be the authority in the general area. The business of dispossession often attracted some form of resistance from owners which sometimes has resulted in injury of death of some persons. a. AU CFC should constitute a joint verification team consisting of SLA and JEM leaders that would visit Dar Essalam and Wada areas to establish the identities of the groups claiming to be opposition parties. b. Leaders of the SLA and JEM are to ensure that extortion within their AQR is curbed and subsequently provide adequate security for lives and property.